We have been manufacturing and installing muzzle devices for over 30 years. Because we do so much of it we have invested a great deal of resources into perfecting the process. If you need the muzzle on your rifle to be threaded for a suppressor or you have a muzzle brake and are looking for someone to install it, our turn around time is a bout 1 week. We can thread for both standard and metric threads left or right hand. Eliminate 60% to 80% of your rifle's recoil by using it's expanding gases to brake the rearward movement of almost any center fire rifle. Kick is produced in two different ways referred to as PRIMARY and SECONDARY recoil. The powder in your cartridge when ignited, expands violently, pushing the bullet through and out your barrel, but for every action there is an equal and opposite reaction, this is primary recoil. Unfortunately this is something we must all learn to live with because there is nothing we can do to reduce it or eliminate it. Fortunately this makes up for only a small percentage of your rifles kick. Secondary recoil is the big problem. This is the recoil created when those gases escape the end of your barrel and propel your rifle like a rocket into your shoulder. Fortunately this can be dealt with by using a muzzle brake. When the bullet leaves the end of the barrel and passes through the break, the back of the bullet acts like a valve and the gases are released at right angles to the barrel canceling each other out and eliminating the gas induced, or secondary recoil. The SCORE HIGH MUZZLE BRAKE has a row of ports on top to eliminate muzzle rise and no ports on the bottom so as not to raise dust off the ground or create shock waves off the ground. The Hunter, $159 installed. This requires a gunsmith installation and includes threading and re-crowning the muzzle, custom fitting and finishing of the brake to match the current finish on the rifle. Available in stainless or blued. Thread size note: Because of varying muzzle diameters, calibers and the position of front sights. We use a large variety of thread sizes. All are .400 long. 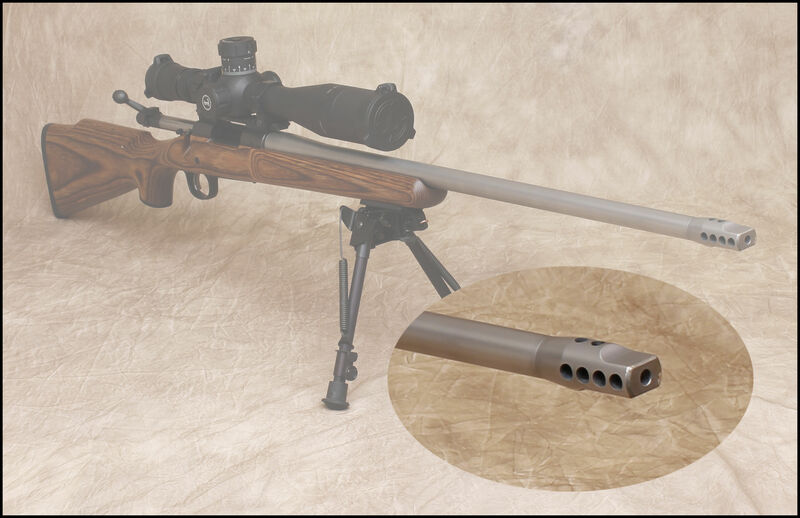 If, in the future you plan to fit a suppressor to your rifle you should choose the Tactical brake because the thread size for the Hunter brake will most likely not work. 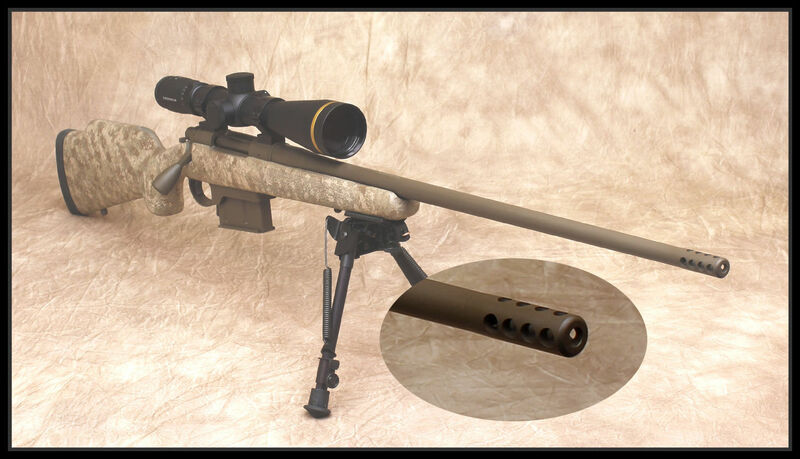 Tactical bolt action rifles or rifles primarily fired from a bi-pod have a different need. The downward thrust from the 4 top ports exerts pressure on the bi-pod causing a slight bounce during recoil. The Tactical Bolt style Score High Muzzle Brake, with the top of the brake limited to 2 ports, perfectly balances the muzzle rise with the downward thrust for the best bi-pod optimizing shooting performance. The Tactical Bolt, $195.00 installed. This requires a gunsmith installation and includes threading and re-crowning the muzzle, custom fitting and finishing of the brake to match the current finish on the rifle. Available in stainless or blued. AR-15, (1/2 - 28 x .700) or AR-10, (5/8 - 24 x .700). If you have any future desires to fit a suppressor to your rifle the thread size of the Tactical Bolt Muzzle Brake fits the broadest array of suppressors available on the market today. We also thread muzzles for suppressors. Just let us know the thread size and we can get the job done. We have recently implemented a program that we hope will make it as easy as possible for you to ship us a long gun for services. Simply give us a call or order online and for $76.00 we will ship you a new Plano 48" single rifle hard case with cardboard shipping box. This includes a pre-paid shipping label covering all the cost of shipping your firearm with $1000.00 of insurance to Score High Gunsmithing, an easy to understand work order form and a copy of our FFL. Some UPS facilities do not understand the shipping regulations as they relate to firearms and the enclosed FFL document should remove all barriers that you may encounter.. Simply attach the pre-paid shipping label enclosed to the outside of the box and present it to any UPS shipping facility. This does not include the cost of return shipping of your completed firearm which typically runs about $45.00. After the work has been completed we will ship you your rifle in the same hard case and then you keep the hard case.